Battery powered lights with 15 color presets. These are very bright in size Par 64. RGBA which means it Includes the addition of an Amber bulb for more color possibilities then similar RGB fixtures. Wireless battery powered makes setup a breeze. 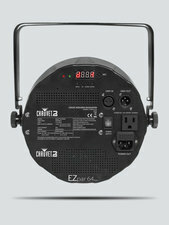 You will need to charge the batteries before your event (can take several hours to fully charge). Plan for battery life of 4-6 hours. Easy to use digital display for selecting your color. Wondering how many Wireless Par 64 RGBA to rent? Just enter either the square footage, or dimensions of the area you want to light in the form below to get an instant recommendation.